Cole County, Missouri Circuit Judge Jon Beetem ruled on March 21 that Missouri must release the names of pharmacies that have provided lethal injection drugs for executions. Judge Beetem ruled in favor of the ACLU of Missouri and several media organizations that had filed three separate suits against the state. The media plaintiffs included the Reporters Committee for Freedom of the Press, the St. Louis Post-Dispatch, The Kansas City Star, the Springfield News-Leader, Associated Press, The Guardian, and BuzzFeed reporter Chris McDaniel. Judge Beetem found that Missouri had "knowingly violated the sunshine law by refusing to disclose records that would reveal the suppliers of lethal injection drugs, because its refusal was based on an interpretation of Missouri statutes that was clearly contrary to law." Bernard Rhodes, an attorney for The Guardian, said the information was critical to public oversight: "Without this information, the public is unable to exercise meaningful oversight of the executions carried out in its name. One of the primary purposes of a free and independent press is to perform a watchdog function over government activities, and this lawsuit is a perfect example of that." Because it determined that Missouri had knowingly violated the law, the court also awarded the plaintiffs more than $100,000 in attorneys fees. 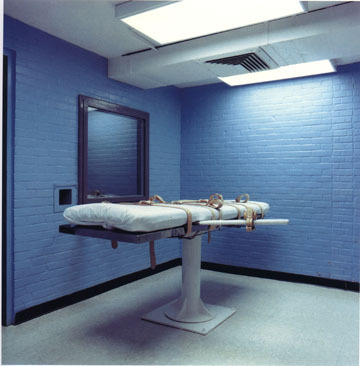 In a column for the Los Angeles Times, Scott Martelle called the decision, "a win for transparency," and said that companies' reluctance to participate publicly in executions was evidence of society's changing views. "[C]apital punishment has become so contrary to American societal norms that here in the land of the quick buck, even the business world has turned its back on the practice," he wrote. The state of Missouri has indicated that it intends to appeal the decision. Missouri has paid state executioners $284,551.84 in cash since November 2013, without providing notification of the payments to tax authorities, according to a BuzzFeed News investigation. The payments, mostly in envelopes filled with $100 bills, were intended to keep the identities of execution team members hidden from the public by limiting the paper trail. However, Missouri's Department of Corrections failed to file 1099 forms with the IRS for the cash payments, potentially contributing to tax evasion and violating federal tax law that requires issuance of 1099s for contractor payments of $600 or more. George Lombardi, director of the Department of Corrections, confirmed that Missouri paid execution team members in cash without issuing 1099s, but defended the practice to the Missouri legislature, saying, "It is my understanding that giving 1099s to these individuals would reveal who they were, and would mean the end of the death penalty, because these individuals wouldn’t do it." A February 2015 audit by the Missouri Auditor's Office found that prison officials also failed to comply with state administrative procedures concerning documentation of the payments. The auditors reported that "[t]he DOC did not record the amount of the cash payments on receipt forms signed by execution team members and did not always require the exchange of the cash payments to be acknowledged by a witness signature, as required by DOC procedures." Discrepancies in state documentation of the payments continued even after the audit, as some state forms - called “confidential execution team member receipts” - were left entirely blank, others lacked a witness signature, and many of the witnesses signed the receipts on different days than did the prison employee who is believed to have delivered the cash envelopes. BuzzFeed found evidence that Arizona and Oklahoma also make cash payments to executioners in the interest of concealing their identities, but Arizona has supplied the appropriate tax forms and Oklahoma's payments may be below the threshold required for issuing 1099s. On January 17, 2006, California executed Clarence Ray Allen, who was 76 years old, legally blind, diabetic, and used a wheelchair. He was the last person the state has executed. A decade later, California's death row population has increased by 100 to 746, making it the largest in the nation. The state has executed 13 prisoners in 40 years at an estimated cost of $4 billion, while more than 100 other prisoners have died on death row. Prisoners wait 11-15 years to be appointed counsel, and the entire appeal process routinely takes 20-25 years. In November 2015, California proposed a new, one-drug lethal injection protocol, but the protocol cannot be implemented until it goes through a public vetting process, which may take years, and then survives legal challenges. This November, California voters may be presented with two competing ballot measures - one that aims to shorten the time between conviction and execution by speeding up the appeal process and another that would abolish the death penalty. A prior referendum to abolish the death penalty failed 48% to 52% in 2012. Commentators close to the issue say California's death penalty isn't working. Jeanne Woodford, who worked at San Quentin for over 25 years and oversaw executions, said that many of those who were sentenced to death were young men, "the very people whose behavior changes over time." Donald Heller, who wrote the initiative that expanded California's death penalty in 1978, said he did so based upon two assumptions about the death penalty that have proven to be false: "The first was that it would deter murders. The second: I assumed defendants would have competent representation." He also voiced concerns about the potential execution of innocent people: "If you have an imperfect system taking someone's life, it's a little bit frightening." Arizona officials have agreed not to schedule any executions until a federal court challenge to the state's lethal injection protocol and secrecy policy is resolved. U.S. District Court Judge Neil V. Wake had previously put the lawsuit on hold while Arizona rewrote its execution protocol. He said the execution hold was necessary to prevent what he called "crisis litigation" -- artificially forcing the court to decide issues in the 60 days before an execution was scheduled to occur. Such litigation, he said, did not allow for adequate consideration of the issues. With the state's agreement not to set new execution dates, Judge Wake will now allow the litigation to proceed. Inmates are suing the state to obtain information about the source of the drugs that will be used in executions. In July 2014, Arizona used midazolam and hydromorphone from anonymous sources to execute Joseph Wood. Arizona's secrecy laws prevented Wood from obtaining key details of how the state intended to execute him. Wood's execution took 2 hours, during which witnesses reported that he gasped and snorted more than 600 times. Arizona later attempted to import sodium thiopental to use in a three-drug protocol, but the shipment was halted by the Food and Drug Administration, which said the drug was being imported illegally. The Ohio Department of Rehabilitation and Correction announced on October 19 that the state was postponing all executions until at least 2017 because it has been unable to obtain the lethal injection drugs necessary to carry them out. Governor John Kasich issued warrants of reprieve rescheduling the executions of 11 death-row prisoners with execution dates in 2016 and a 12th with a January 2017 execution date. Ohio rescheduled the executions for dates in 2017 through 2019. The Department issued a statement explaining that "over the past few years it has become exceedingly difficult to secure [execution] drugs because of severe supply and distribution restrictions." Ohio passed a secrecy law to shield the identity of any lethal injection drug provider. However, the Columbus Dispatch recently reported that the law did not work because Ohio pharmacies, bound by the Hippocratic oath or fearing adverse reactions from their customers, did not want to be involved in executions. Ohio also has been unable to obtain lethal injection drugs from abroad. In June, the U.S. Food & Drug Administration warned the state that importation of execution drugs would violate federal law. The state has sent a letter to the FDA arguing that it should be able to legally import sodium thiopental for executions. Ohio's last execution was the botched execution of Dennis McGuire on January 16, 2014, using an experimental two-drug protocol of midazolam and hydromorphone. Witnesses reported that McGuire gasped, snorted, and struggled throughout the execution, taking 25 minutes to die. After that execution, Ohio announced that it would shift to a one-drug protocol of either pentobarbital or sodium thiopental.